A trip with no children? 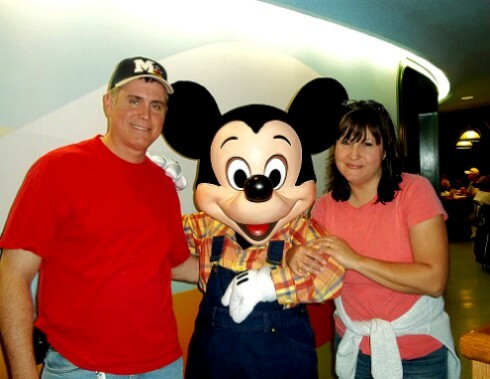 While bringing your kiddos to Walt Disney World is always great for a family vacation, adults-only trips have provided me with some of my best WDW memories. Whether it was going with my friends in college, traveling with my husband on our anniversary, or taking a “girls-only” vacation, Disney World has always been my first choice for a vacation that combines fun with relaxation in equal measure. So, while my previous articles discussed which resorts to choose for your children at different ages (here, here, and here), this article focuses on the best resorts for those on a kids-free vacation. Let’s get started. 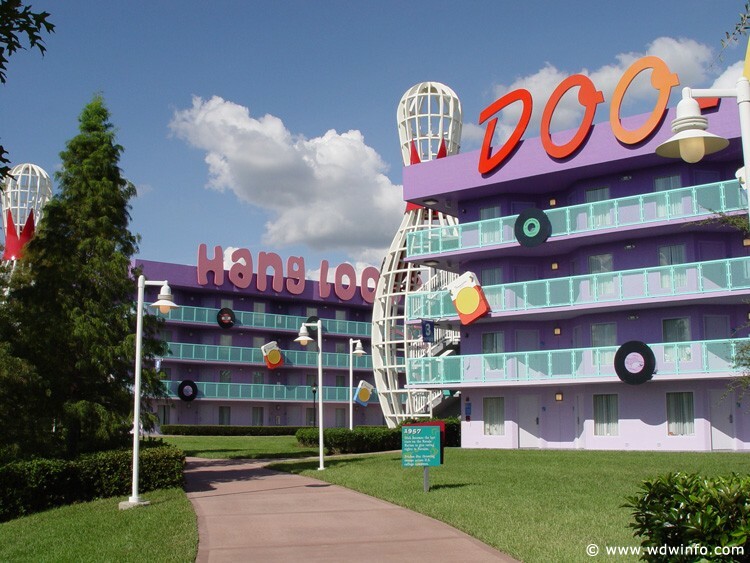 I’m sticking with Disney’s Pop Century Resort here, for several reasons. The main one being — it’s simply a fun resort. 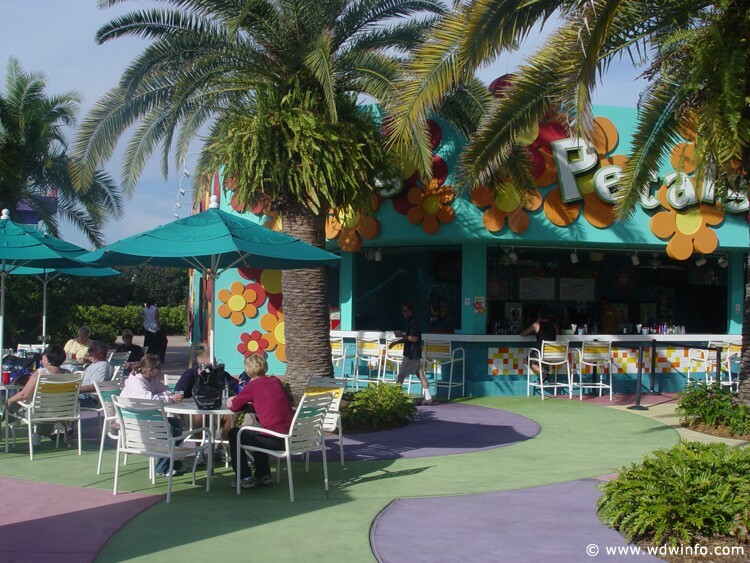 The theming, the location, the accessibility to not only the Pop Century food court, but also the quick walk to the Art of Animation food court, make Pop Century a great choice, no matter what your circumstances. The other reason is because the All-Star resorts are often home to cheerleading squads, dance teams, and sports teams visiting Disney World for competitions. I have nothing against this. My own daughter stayed at All Star Music when her high school dance team was competing at WDW. Our family stayed at Pop Century, however. 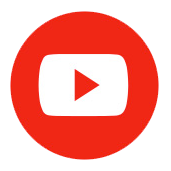 The main reason is that huge concentrations of excited kids are loud. Very loud in some cases. And that’s understandable; they’re at Disney World, who wouldn’t be excited? I love their enthusiasm. I was the same way on my high school trip. But if you’re looking to spend some time on an adult trip with no children around, the All Star resorts are not your friend. 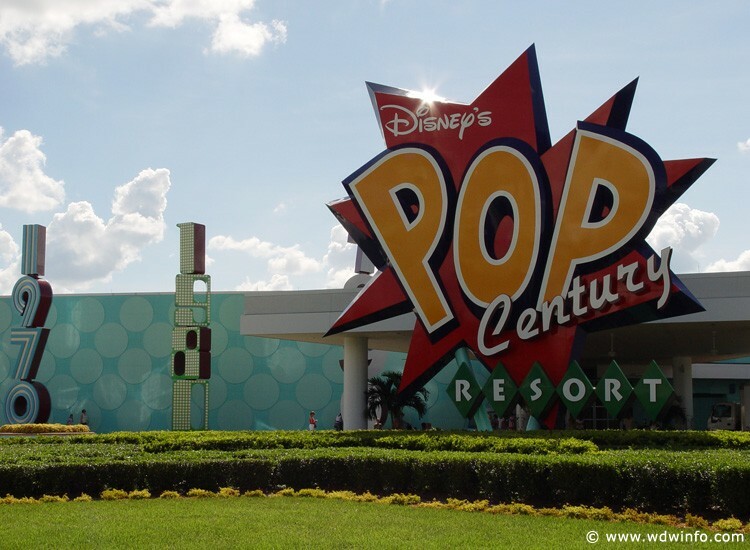 While there will be children at Pop Century (plenty of them), they are generally with their families, and not part of a large group of thirty or more. The chaos is greatly reduced at Pop for this reason. I’ve also found that because the value resorts have so many families staying there, the hotel empties out during the day, making for a very relaxing, quiet atmosphere. It’s a great place to have a “pool day” on your adult trip. If you request the 1960s building (some are “preferred rooms” because of their proximity to the main building, so they cost a bit extra), you’ll be very close to the Hippy-Dippy Pool and Petals Pool Bar. It makes for a nice location for some sun, surf, and liquid refreshment on a hot Florida day. My choice in this category is Disney’s Coronado Springs Resort. Okay, let me start off by saying that this resort is under construction. A new fifteen-story tower hotel is being added to the Coronado complex, as well as other development projects (including a restaurant in the middle of the lake). However, I have it on good authority that the impact of construction on guests staying at the resort is minimal, and should not affect your visit at all. (This is not the case for the Caribbean Beach resort, where guests are definitely being affected by the construction happening there, and why I cannot recommend that resort for anybody at this time.) Just be sure you request a room far away from the construction zone. I love Coronado Springs for a lot of reasons. First, it’s a beautiful resort. The buildings, the landscaping, the water features, the pool — it’s all gorgeous. The theming here is very well done. Disney describes it as a combination of Spanish Colonial Mexico and the American Southwest. The buildings are lovely and colorful, and the resort has a very fun vibe. One of the unique features of this resort is that it’s a convention center. Where this might discourage me from staying here for a family vacation with my children, I think it’s perfect for an adults-only trip. Because Coronado Springs does host large groups of convention attendees, I find the amenities here to be more upscale then the other moderates. 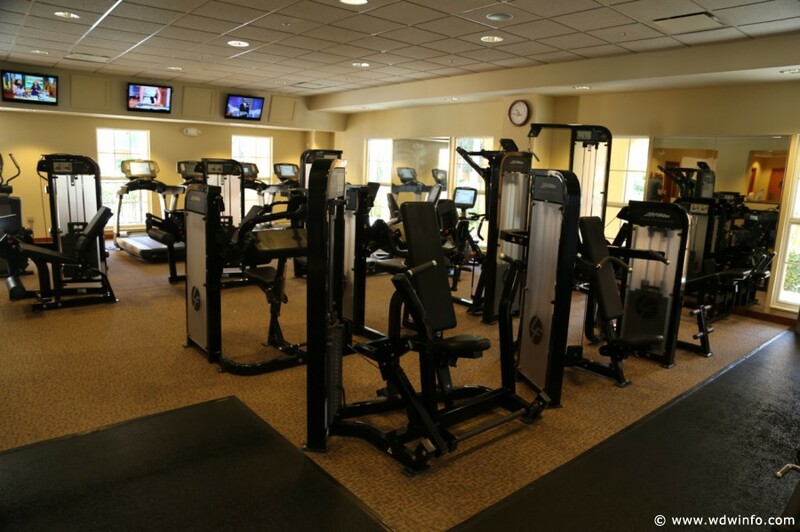 For example, this is the only moderate resort with a fitness center and a spa. While not as large or luxurious as the facilities at a deluxe resort, they’re still very nice, and a lovely added perk to take advantage of during your stay. 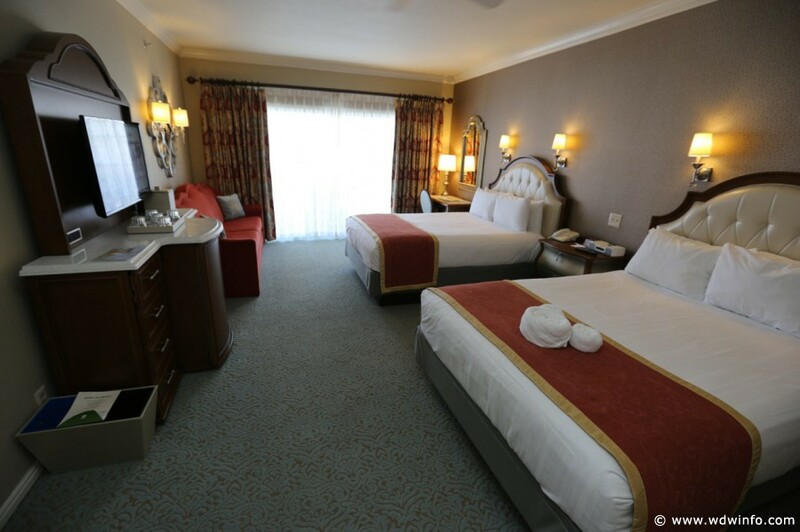 The Coronado Springs rooms have been recently refurbished (not sure if they’ve completed this yet, so request one of the refurbished rooms when making your reservation), and they’re functional and beautiful. They’ve somehow made the rooms themselves seem larger. 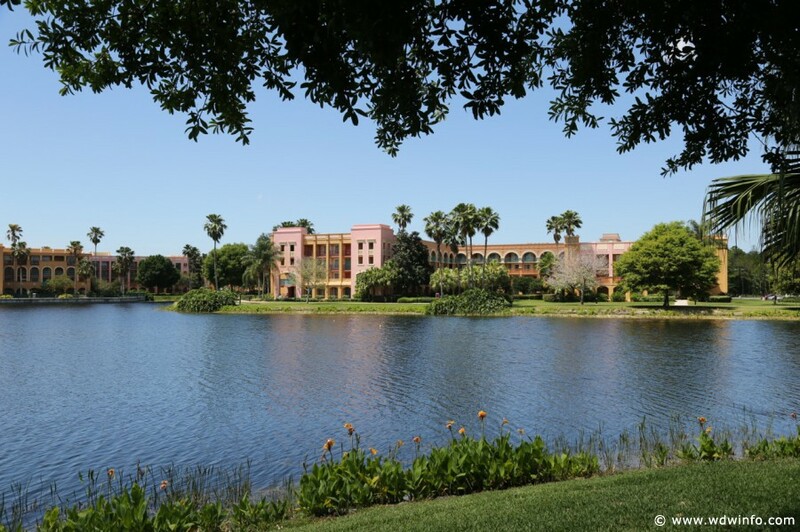 They have several different categories of rooms (including suites, which sleep six) in their inventory, so if you’re bringing a group of friends, Coronado Springs might be better able to meet your needs than some of the other Disney resorts. 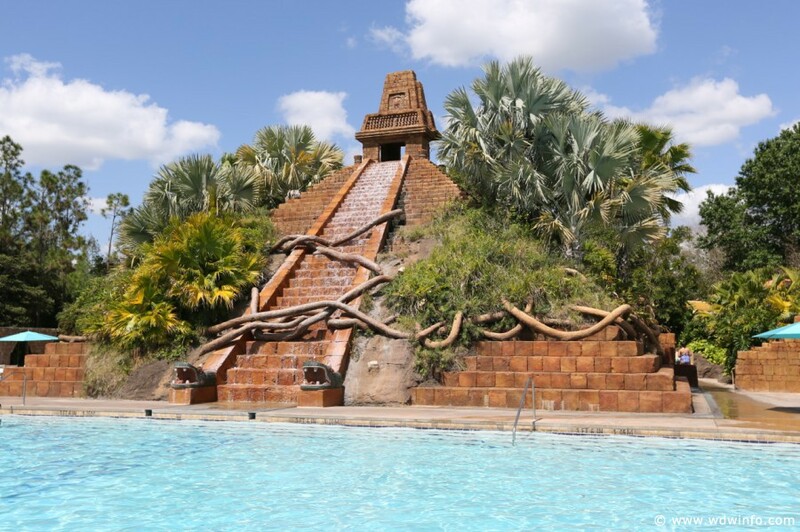 One of the best features of Coronado Springs is the pool area. The main pool is called The Dig Site. (There are two other quiet pools on property as well.) It is themed as an archaeological excavation of a Mayan city, with the biggest artifact being the magnificent, fifty-foot high Mayan pyramid (that doubles as a waterfall and water slide). It’s really a lovely area, and the theming continues to the playground, sand volleyball court, arcade area, and hot tub. It is a wonderful place to relax and soak up the sun. You can also enjoy a quick service meal and drinks at Siesta’s Cantina, located near the main pool. Again, because of the convention center, this hotel offers more dining options than any other Disney moderate hotel, which makes it nice for an adult trip. 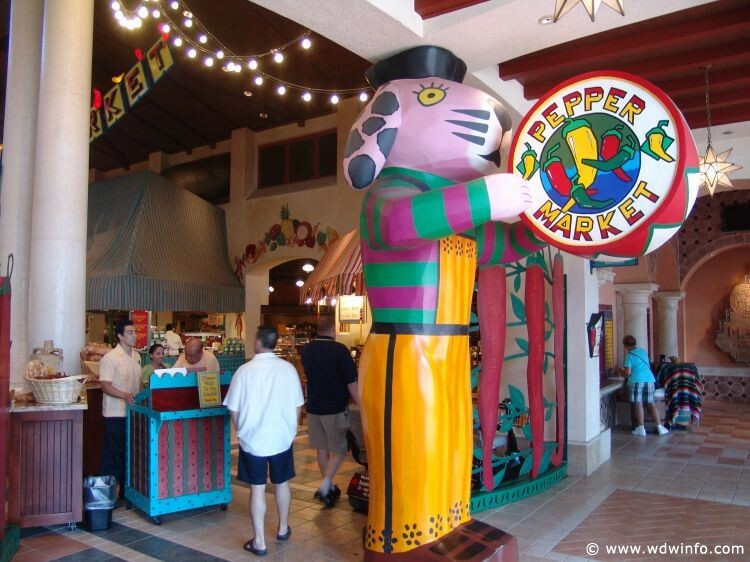 Pepper Market is the quick service option here, open for breakfast, lunch and dinner. It serves the basic Disney options for all meals, including some with a slight Mexican flair. Rix is the grab-and-go, also open for all three main meals. 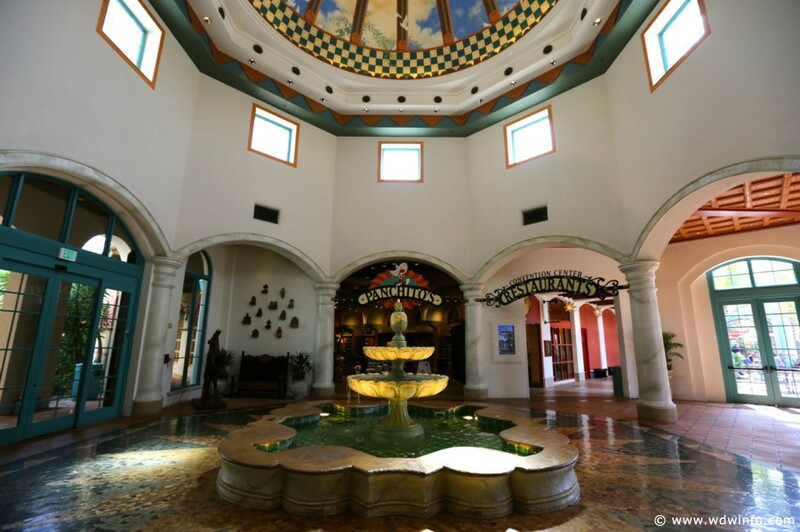 Coronado Springs has two sit down restaurants (with a third coming when the construction projects are completed): Las Ventanas, serving traditional American food, and the Maya Grill, specializing in Mexican cuisine. Both of these eateries are open for breakfast, lunch, and dinner. In addition, unlike Disney’s other moderate resorts, twenty-four hour room service meals are available for those who wish to eat in their hotel room. Disney will add a service charge, gratuity, and tax for this option. 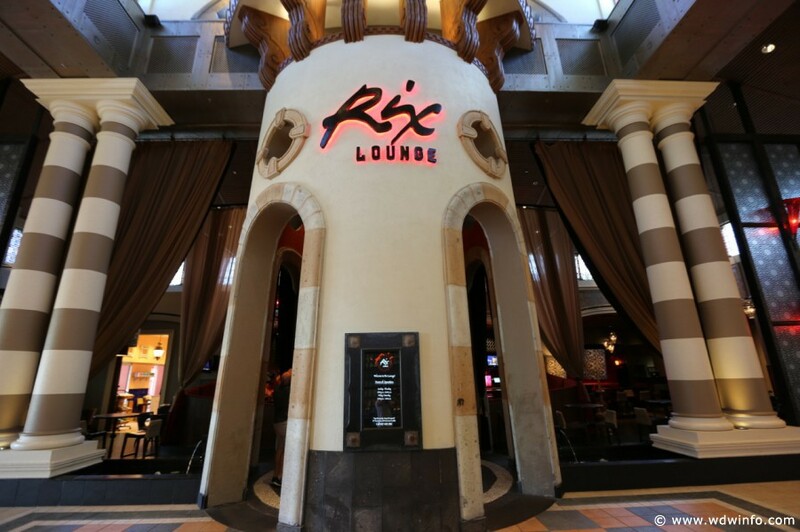 And, for those wishing to enjoy a more adult atmosphere than you would on a vacation with your kids, Coronado Springs has Rix Lounge. In addition to the many adult beverages available, you can also order food. It’s a festive atmosphere, and packed to the gills with conventioneers in the evenings. It’s open from 5 PM to 2 AM. Transportation at Coronado Springs Resort is courtesy of the Disney bus system. Another difficult choice for me for the same reason; you can’t really go wrong with any Disney deluxe option. But ultimately, my choice for this category is Disney’s Grand Floridian Resort & Spa. 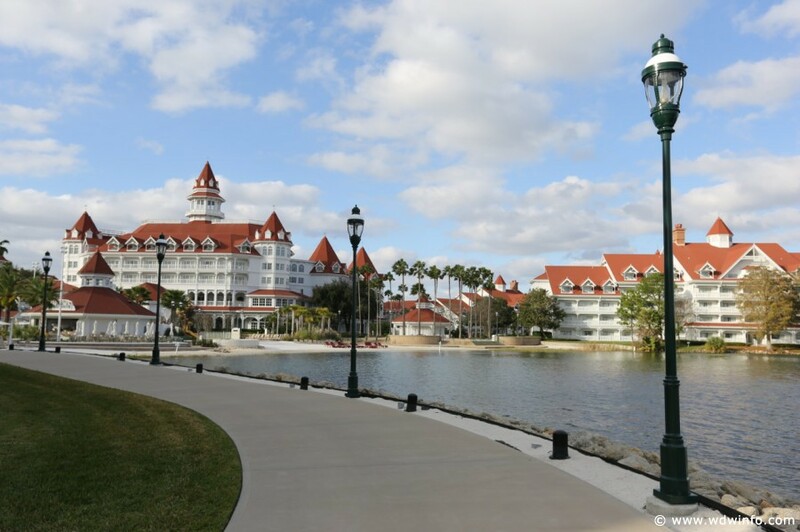 The Grand Floridian is Disney’s flagship resort, and it really shows. 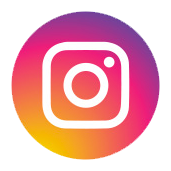 It takes its inspiration from the Flagler resorts of turn-of-the-century Florida, and the Hotel Del Coronado in San Diego. 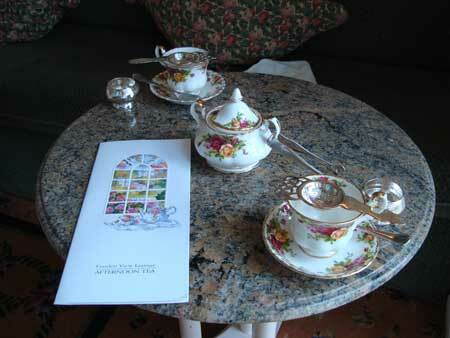 It is themed in the Victorian style, but it isn’t gaudy or fussy. It’s beautiful and elegant, and a lovely place to stay for a romantic vacation, or just a fun week with friends. 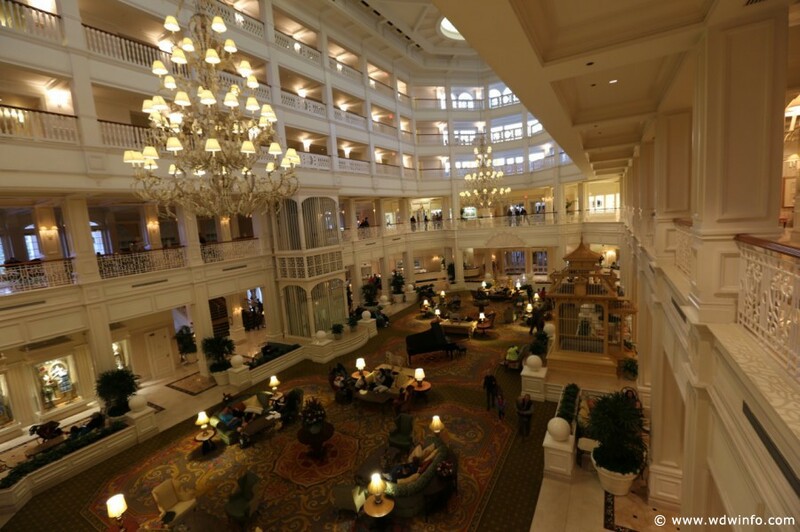 I think the Grand Floridian is perfect for an adult trip, because the overall ambience is more subdued, hushed, and relaxing than say….The Contemporary. It just feels like a more grown-up resort. When you walk into the five-story open lobby, you definitely feel that you are about to experience a vacation filled with quiet luxury and sophistication. From the exquisite floral arrangements to the grand piano, Disney goes out of its way to make sure your stay here will be a special one. The standard rooms (which sleep five) are around 440 square feet, and beautifully decorated. It’s not your grandmother’s Victorian bedroom. Everything is understated in muted tones of pearl and taupe, with a pop of subdued red in the daybed and other decorative elements. The whole atmosphere is very relaxing. You also have a balcony or patio, and even the standard views here overlook the elegantly landscaped flower beds and lawns. There are several options for suites at the Grand Floridian, including six honeymoon suites. The resort also has “cozier” dormer rooms which only sleep four, but I think they’re perfect for a romantic getaway. The dining options at the Grand Floridian are some of the best on property, and definitely worth splurging on. 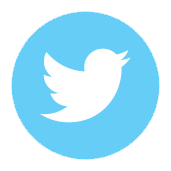 Gasparilla Island Grill is the quick service, and very typical of all other deluxe quick service locations. It’s open twenty-four hours a day, which is very handy if you have a middle of the night craving for a snack. 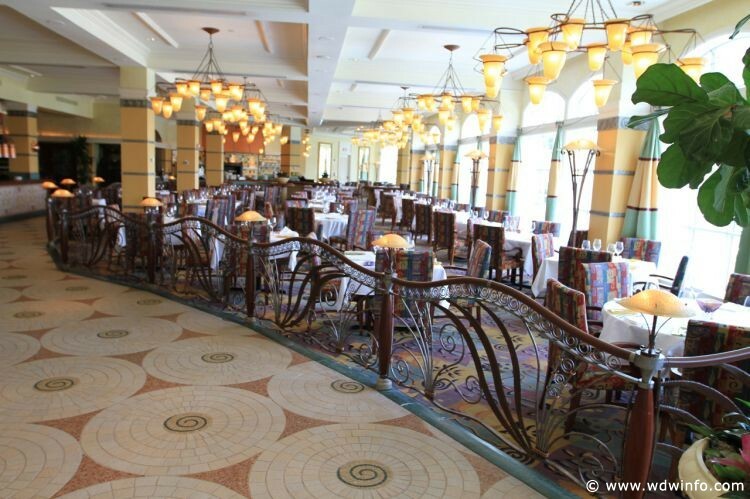 1900 Park Fare is the character meal restaurant in the Grand Floridian. For breakfast, you will dine with Mary Poppins and her friends, and for dinner, Cinderella, the Prince, and the stepsisters with Lady Tremaine. If you enjoy character meals, I recommend dinner, as the stepsisters are hilarious and make it worth the trip. The Grand Floridian Café is the resort’s more casual, family-friendly table service restaurant. The food here is decent (I love the strawberry salad), and it’s a great place to go if you don’t have a reservation anywhere in Magic Kingdom but would like to have a sit-down meal. They’re never busy, and can almost always accommodate walk-ups. 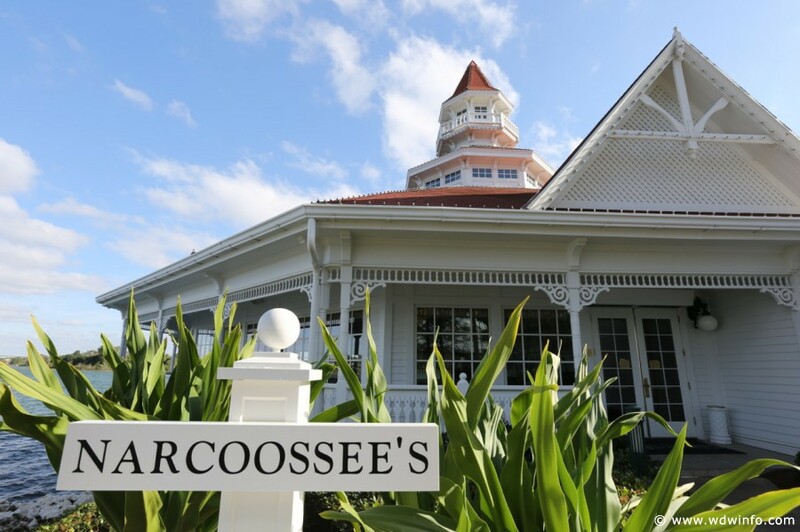 Narcoosee’s is a signature dining option (two table service credits on the Disney Dining Plan) located at the end of the boat dock behind the Grand Floridian hotel. Even though the signature dining dress code is required* it still feels very relaxed and beachy. It’s very open and airy, and a lovely place to have a meal. While seafood is their specialty, there are plenty of other options as well. The food is delicious, and if you’re there at the right time, you have a great view of the Magic Kingdom fireworks. Citricos is the other signature dining option at the Grand Floridian. Disney describes the menu here as “American cuisine infused with Mediterranean flavors.” I describe it as delicious. 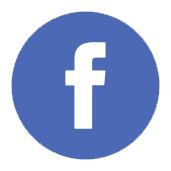 This is a very comfortable restaurant, and even though the dress code is applicable here as well, the restaurant never feels stuffy or snooty. 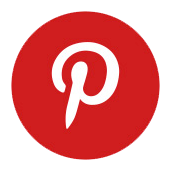 You will have a wonderful meal, with excellent service and a relaxed pace. Lovely for a romantic evening. 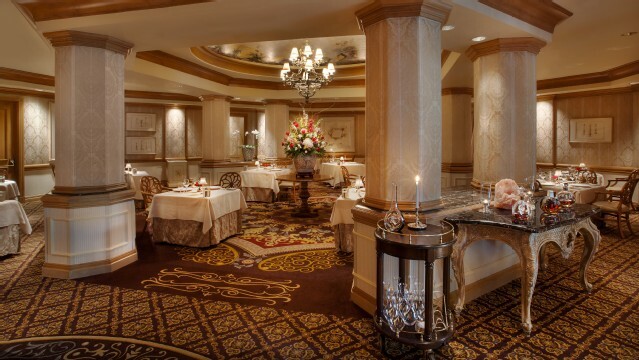 Victoria and Albert’s is a dining experience unto itself. There really isn’t anything comparable in Walt Disney World. This is a AAA Five Diamond Award-winning restaurant, and everything about it reflects that status. You have to be dressed up to eat here (men in jackets and ties, women in dresses, skirts, or nice pantsuits), and you have to reserve it as far in advance as possible. It is well worth dining here if you have the opportunity. I discuss this restaurant in far more detail in a previous article here, if you’re interested. 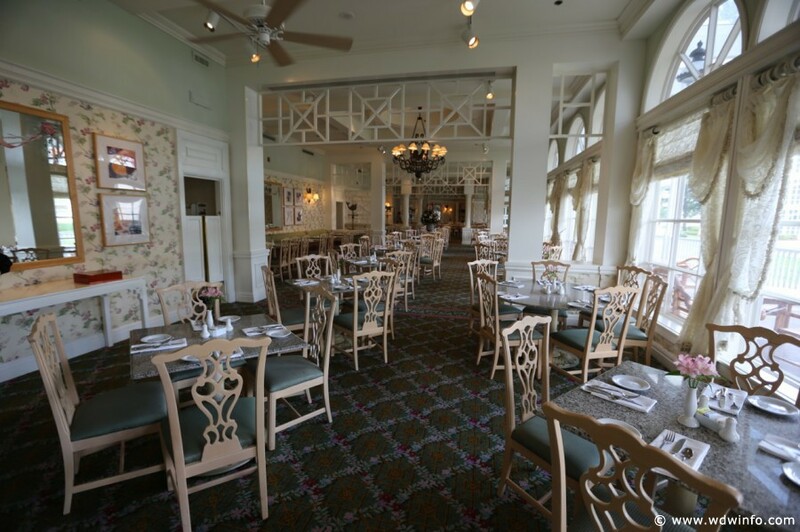 Another fun dining experience worth your time (and easier on your wallet than V & A’s) at the Grand Floridian is afternoon tea in the Garden View Tea Room. This is a lovely experience, and so relaxing. There are different price levels, depending on what you’d like to enjoy, and everything I’ve had here has been delicious. 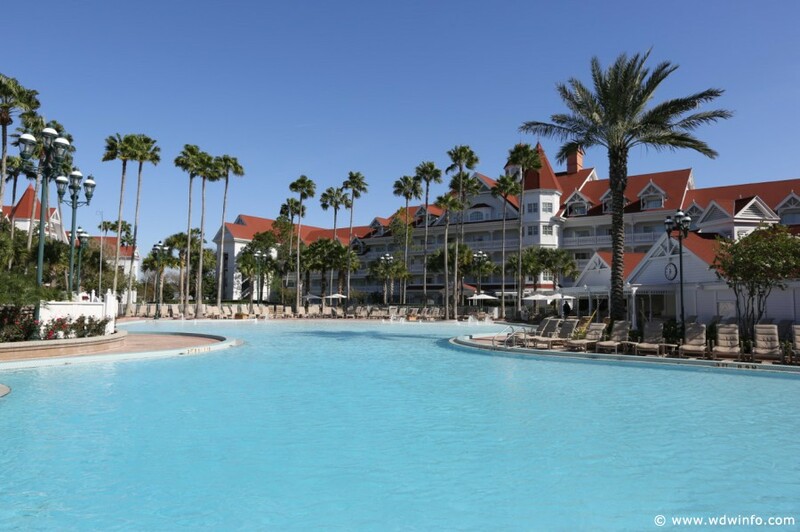 The Grand Floridian has two pools. The Beach Pool is the main pool area. It has a nearby Alice In Wonderland splash pad feature — which is adorable, and lots of fun for the kiddos — but since we’re talking an adults-only trip here, the Courtyard Pool is much quieter, and rarely busy during the day. It’s a great place to relax in a lounge chair with a book on a non-park day. Both pools have a pool bar to meet your snack and beverage needs. 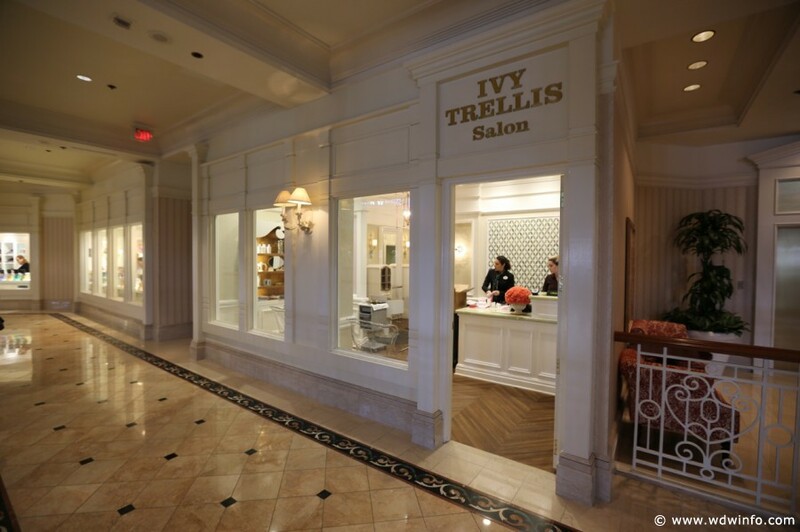 The Grand Floridian also has a fitness center and a beautiful full-service spa, Senses, as well as a hair salon (the only one I know of on property, not counting the barbershop on Main Street in the Magic Kingdom). The shopping at Grand Floridian is some of the best at Disney, so be sure to check out all of their wonderful stores (including Basin, Summer White, and Commander Porter’s), even if you’re not staying here. The Grand Floridian resort is served by Disney’s monorail, boats, and bus transportation. So, what are your favorite resorts for an adults-only Disney trip, and why? I love hearing what others enjoy. Let me know in the comments.